The currency of the United States was backed by silver and gold for one hundred-eighty years (from 1792 to 1971). During this era of sound money, the rise in the over-all prosperity of the citizenry of the nation was meteoric. The poorest immigrants enjoyed upward economic-mobility. If you are wondering why the living standards for most Americans are now declining, look FIRST to the Federal Reserve’s debasement of our money. Until August 15, 1971, the dollar was REAL MONEY because it represented tangible value. Today, U.S. currency has no intrinsic value (. When gold-backing was completely removed on August 15, 1971, the dollar is FIAT MONEY: U.S. currency has no intrinsic value (gold-backing was completely removed on August 15, 1971). A $20 coin now costs $1,340, instead of $20. It takes more than 60 times as many dollars to buy the same amount of gold. That means our grandparents and great-grandparents could have purchased at least 60 times more goods and services than we can in 2017 (with the same number of paper dollars). Over time, gold retains purchasing power: The gold dollars above [$1 coins] can buy about 68 times more ‘stuff’ than the paper dollars in your pocket! Money-printing is a double whammy for savers. Not only is the dollar continually losing purchasing power, the Federal Reserve’s artificially low interest rates have destroyed people’s ability to achieve yield. For 100 months, holders of U.S. Treasury Bonds have been unable to earn enough interest to compensate for the eroding value of the dollar. Yield-starved retirement funds are on their way to needing a bail-out. 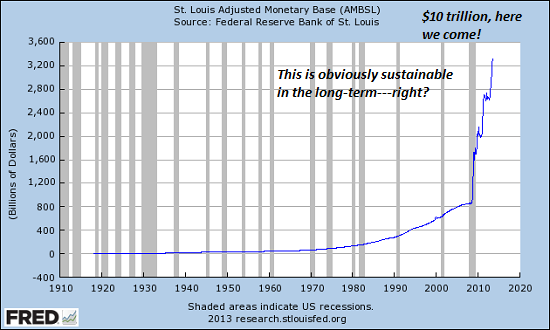 Image of Federal Reserve Adjusted Monetary Base courtesy of ZeroHedge. The French philosopher Voltaire wisely noted that all fiat currencies end up returning to their intrinsic value: ZERO. Since the day credit froze around the globe [Aug. 9, 2007*], U.S. debt has more than doubled and the dollar has fallen dramatically against gold. The high price of gold is signaling the world’s declining confidence in the dollar-reserve system. We named our website “YouShouldBuyGold.com” because there is no better way than gold to protect your savings from currency debasement. Before money-printing shifts into high-gear, exchange paper currency for “monetary metals.” There is no third-party risk when you take possession of physical silver and gold coins. * Schumpeter blog at economist.com; Aug. 9, 2012, Associated Press. Gold-backed currencies are “hard” currencies. “Fiat” currencies have no intrinsic value. In the past, the existence of national hard currencies discouraged countries with fiat currencies from wildly inflating their money supplies. When nations debased their money, people could flee from the fiat currencies, and flock to available hard currencies. That changed with the bombings of Iraq and Libya [U.S./ NATO invasion of Libya, March 19, 2011]. For the first time, not one national hard currency exists anywhere in the world. Since gold convertibility was suspended in 1971, the dollar has retained its reserve-currency status because of the dollar’s forty-year monopoly in settling OPEC oil trades – THE PETRO DOLLAR SYSTEM: http://www.youshouldbuygold.com/gold-the-petro-dollar-and-us-foreign-policy/]. “Inflation: An increase in the amount of currency in circulation, resulting in a relatively sharp and sudden fall in its value and rise in prices. The rise in prices is caused by an increase in the volume of paper money issued.” Webster’s New Twentieth Century Dictionary, George W. Ogilvie, unabridged, USA, 1904.